Jack Gruber, shown here in the desert before the start of the Iraq War, will be one of the featured speakers at the Sports Shooter Commuter Short Course. The Sports Shooter Commuter Short Course is a weekend of great photography, inspiring stories from some of the top photojournalists working today and educational classes in a relaxed, fun atmosphere. To be held Nov. 4 - 5, 2005 on the Ventura campus of Brooks Institute of Photography, the Commuter Short Course features Deanne Fitzmaurice, 2005 Pulitzer Prize winner from the San Francisco Chronicle, San Francisco Chronicle picture editor Kathleen Hennessy and USA TODAY's Jack Gruber. Fitzmaurice will discuss her picture story on the journey of 9-year-old Iraqi boy who was nearly killed by an explosion and his miraculous recovery. Joining her will be Chronicle picture editor Hennessy to discuss the importance of planning and team work in successful documentary projects. Gruber will show and talk about his work this year in some of the world's biggest hot spots: The Sudan, Iraq and the Tsunami in Southern Asian. The Commuter Short Course will also feature several small breakout classes. These sessions include: "Get a Job! ", "Sports Beyond the Action", "Community Journalism", "Photoshop for Photojournalists", "Portraits Behind and in Front of the Camera" and "Using Light, Creative "Seeing": Getting The Most Out Of An Assignment". Attendees will be able to take up to three breakout classes. Details and course descriptions are below. A portfolio review session will also be a part of this event, featuring the faculty and local photographers and editors. Canon and Nikon will be participating in a trade show in conjunction with this event, with personnel on site to show off, demonstrate and offer sessions on their latest equipment. More details on Nikon and Canon's participation will be released to those registered for the Commuter Short Course. Because of the participation of Brooks, Nikon and Canon this event is FREE. The portfolio review session and the Nikon and Canon sponsored presentations will take place Friday night at the official hotel, the Holiday Inn Ventura. The Holiday Inn Ventura, the official hotel for the Sports Shooter Commuter Short Course, just completed a mulit-million dollar remodeling project. 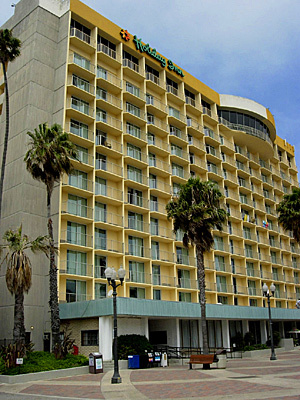 Sports Shooter has arranged a special group rate for rooms at the Holiday Inn Ventura. Details will be in your confirmation email. To participate in this educational and inspirational weekend, complete the on-line registration form. Once your registration form has been received, you will be notified via email of your status for the commuter Short Course. Because several of the breakout classes have limited seating capacity, please only sign up for the Commuter Short Course if you really are planning on attending. Signing up and not showing up will only deprive a fellow student or photographer an opportunity to attend this fabulous event. The schedule will be sent out once you are accepted into this event. Speakers announced here are subject to availability. This panel lead by Rick Rickman will discuss the ins and outs of getting a job in the wacky, wonderful world of photography. Is there a winning combination of images that an editor looks for in a portfolio? What presentation is best when showing your work … a digital portfolio? Prints? Tear sheets? Good old fashion slide pages? Or none of the above? Freelancing assignments will also be covered in this session and the panel of editors and photographers will give participants tips and hints on how to pitch prospective ideas to editors to get work. Once you've covered a few sporting events, it's easy to enter a comfort zone. You find your favorite spots on the sidelines, foul lines or baselines, and whale away on your longest lens, the motor-drive and auto-focus doing most of your work. Many of your thoughts are occupied with "should I have one hot dog or two at halftime?" and "can I leave early to beat the traffic?" Don't be ashamed. We've all been there. Rod Mar, a sports photographer at the Seattle Times will inspire you to look both into and beyond the action to find those "journalistic" moments in sports. Mar regularly finds little "gems" of moments in the chaos of sports events, and brings his readers images that go beyond what they will see on the nightly highlight shows. In this "SportsCenter" era, fans see instant replays on big screens at the games, and then can see those same plays over and over again on television that night. Mar works hard to show something new and fresh to the readers of the Times the next morning. Whether it be a different angle, or a moment behind-the-scenes, you will learn how to bring the "journalism" back into your sports photography in this fun and informative session. All 260 guest rooms in the Holiday Inn Ventura have an ocean view. Community journalism can often mean cruising for weather features, Friday night prep football games and church bake sales. Consider the Ventura Star … seven-time winner of the title "Photo Staff of the Year" and staffer Matt McClain is a five-time regional "photographer of the year". Whether it is localizing an international story like the Tsunami or covering a breaking news story like the La Conchita mudslides or looking for whether features, the staff of the Ventura Star shines. A panel of photographers and editors from the Star will show their work and discuss how community journalism can be visually interesting while also providing its readers with a look at what's going on in the area and what's going on with its residence. Do your photos look a little dull? 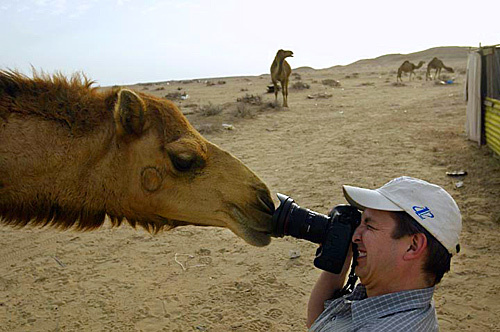 Are they lacking that snap you envisioned when you clicked the shutter? Are you "Photoshop - challenged"? Chip Litherland will demonstrate his unique talents and techniques in Photoshop that give his images that certain "pop" that digital cameras (and bad exposures and color balance!) seem to take away. So much is made these days on cool lighting techniques and wiz-bang equipment that are used in portrait photography. But what about the thought process a photographer goes through to decide what technique to use and what to do with the subject? This session not so much about lighting as it is simply about portrait photography. It will not only discuss various lighting "looks" and techniques but also the creative process of working with a subject or a theme to produce visually interesting and perceptive images of people. From simple hand-held flashes to optical spots, this portrait class will be about lighting, style and most importantly thinking. What separates a "good" photograph from one that an editor holds up in the afternoon news meeting and yells out "This photo has gotta run 6 columns"? Sometimes it is simply using light. Or waiting for that subject to pause as they walk through a graphic archway. Maybe it's going to the top of a building where no other photographer is. Award-winning photographers Wally Skalij and Donald Miralle will show several examples of their work and break down what was going through their mind and the through process they went through as they looked at these assignments. The ability to "see" creatively and translate that vision to what a photographer frames in his lens when he presses the shutter release is the theme of this session. Wally and Donald will share what motivates them and the little secrets and tips that makes them two of the top photographers working today.